The home-improvement giant posts quarterly results on May 19. With the stock up 47% in the last year, investors have high expectations for Home Depot's (NYSE:HD) first-quarter results, which are due out on Tuesday. Three months ago, the retailer trounced forecasts on the back of an 8% comparable-store sales gain. Profit in the fourth quarter leaped higher by 37%, also beating estimates. Wall Street is looking for another solid showing this quarter: Sales are forecast to rise 6% while earnings are estimated to spike by 20%. 2015 Q1 is average projection of the 27 analysts who cover Home Depot stock. Source: Company financial filings and Yahoo! Finance. With the bigger picture in mind, here are three details to watch for in this week's release. Home Depot's comps improved by 5.3% through all of 2014. The highest quarterly gain, 8%, came in the fourth quarter. However, management expects weaker growth this year: The official forecast is for comps between 3.3% and 4.5%. Most of that difference involves currency issues, though, as the stronger dollar is expected to hurt reported sales by about $1 billion. By comparison, Home Depot's stellar 2014 added $4 billion to the top-line total as the company hit record revenue of $83 billion. Absent foreign currency exchange, the business will be dependent on more improvement in the broader economy. In February, CEO Craig Menear said management anticipated a "moderate recovery" in the housing market in 2015, on par with last year's growth. Watch for any updates to that estimate. Home Depot operating margin hit an all-time high last year of 12.6%. 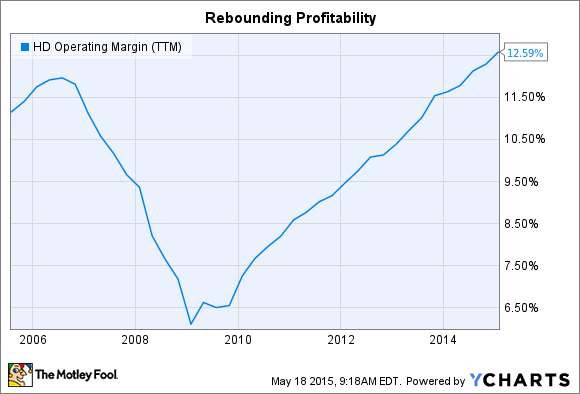 After bottoming out through the housing crisis in 2009, profitability has roughly doubled. Look for more steady profit gains this year. Management sees operating margin growing to over 13% in 2015 as the company holds the line on costs while sales march higher. Home Depot isn't expecting to splurge on capital expenditures either: Plans call for adding just six new stores to its global footprint. At the end of the fourth quarter, the company operated 2,269 retail store. Shareholders should see heavy spending on capital returns this quarter. In fact, Home Depot is targeting $18 billion in spending on stock buybacks through the next three years, with roughly $5 billion due in 2015. By comparison, it spent $8.5 billion in 2013 on share repurchases and $7 billion in 2014. Meanwhile, management is targeting returning 50% of earnings to shareholders in the form of dividends. That explains why Home Depot's payout is growing so quickly -- it's just tracking profit gains. The company hiked its dividend by 26% for 2015 following 2014's 34% boost. 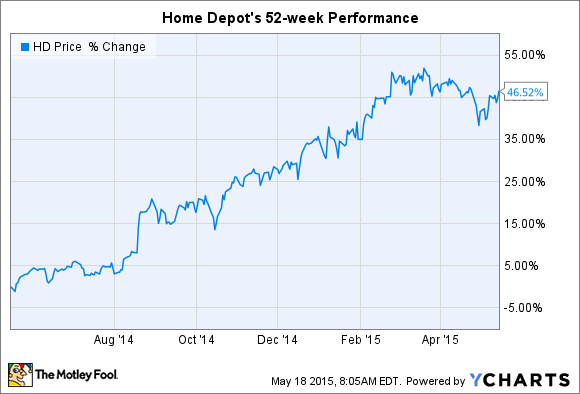 Those returns are ultimately powered by Home Depot's improving financial position. The company two years ago laid out a plan to eventually reach 13% operating margin and a 27% return on invested capital. Home Depot looks set to easily achieve both of those long-term financial goals this year.